Each year, millions of Americans commit to countless New Year’s Resolutions. Some are frivolous (binge-watching Game of Throne). Others, more serious (exercising 30 minutes each day). Not surprisingly, most resolutions grow out of a desire to improve – physically, intellectually, psychologically, emotionally, professionally. But despite this underlying desire to improve, we often skip an important step in picking a New Year’s resolution – a step that is critical to both choosing the ‘best’ resolution and being able to follow-through on it. That step is self-reflection. Imagine how much ‘improved’ your life might be if you took a few minutes each day to reflect on a few questions about the day and your actions in it. 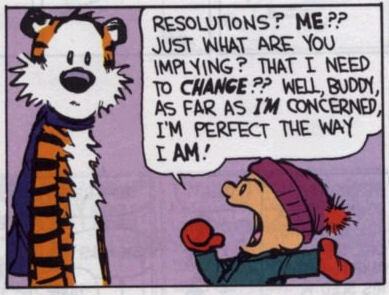 Imagine how rich your life might be if self-reflection became not just a way of identifying your New Year’s resolution, but the resolution itself. St. Ignatius, the founder of the Jesuits, had a term for this daily reflection. He called it the ‘examen.’ Ignatius’ commitment to the examen grew out of three core beliefs. First, that God exists and can be found in all things. Second, that the goal of our lives is to be in relationship with God. And finally, Ignatius believed that God has a plan for each of us and that we are happiest, most content, most whole when we’re living out that plan. Through an Ignatian lens, then, engaging in a daily examen provides us with an opportunity to recognize God’s presence in our lives, deepen our relationship with the Divine, and come to understand what we’re called to do, what gives us our deepest sense of fulfillment. Calvin & Hobbes. Image Source. So how does one “do” an examen? There are as many variations of the examen as there are days in a year or life-experiences. The examen can be adapted to best fit the way we experience and reflect on life. Below is a simple, four-step examen process that I like, but you can find countless variations on websites such as ignatianspirituality.com. Review your day (actually re-live it in your imagination) and pay attention to the parts of your day and the interactions you have that bring you internal joy and contentment. (Ignatius calls this internal joy “consolation.”) As you identify these moments of consolation, give thanks. As you become more practiced with the examen, you’ll begin to notice a pattern in those things that bring you joy; you’ll begin to live towards this inner joy. Review your day a second time, this time noting the times you felt empty, lacking, or unfulfilled. You may have said or done something you regret. You may have felt negatively about someone you saw or interacted with. You may not have done something you wish you had. Ignatius called the empty feeling associated with these reflections “desolation.” Don’t hesitate to name those moments of desolation. Be honest with yourself. And in naming them, pray for the ability to do better next time. With step 2 in mind, ask yourself if there is someone (including God) with whom you need to reconcile. Whether in person or in your heart, is there someone you’d like to ‘make things right’ with? I especially like this fourth step – a step that invites you to use your imagination looking forward. Picture yourself being sent forth into the next day by God – not to be anyone different than who you are, but maybe to be the best person you are. Imagine yourself acting and interacting in a way that will lead to moments of consolation in your next day’s examen. In short, a daily examen provides us with an opportunity to ask, “How did I do today?” Just as importantly, it invites and challenges us to make plans to do better tomorrow. As with any action, it gets easier and more effective the more we do it. And finally, it doesn’t have to be January 1st to commit to it. Being more self-reflective pays off regardless of when you start it. So give it a try. Commit to practicing a daily examen for 5 minutes each day, for 10 days. I’m confident that if you do, you’ll make life choices you feel better about and, who knows, you may even commit to a new resolution. How has the examen influenced your daily life, your priorities, your resolution(s)? We’d love to hear about your experiences in the comments section below. Matt has worked in Jesuit high schools for 36 years and has been the Executive Director of the ISC for the past two. For Matt, trying to apply Ignatian Spirituality to everyday life poses some of life’s greatest challenges and, at the same time, presents some of life’s greatest rewards. Stay tuned as this blog will reflect both.